RIM hasn’t been having the best of luck selling their Playbooks in the last year, the over saturated market left a large percentage of consumers uninterested in it. Released with its own operating system and an email app that requires a Blackberry , the Playbook was a little too much of a learning curve for buyers just looking to replace their laptop. RIM was eventually forced to drop the price of every model by $300, just to move their massive piles of inventory (following in the steps of HP’s ill-fated TouchPad). 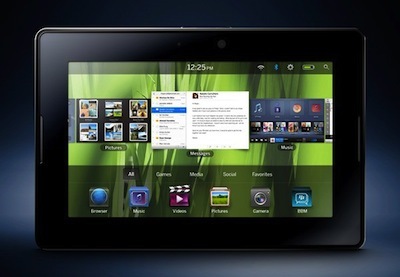 Prior to the new Ipad’s launch last week, RIM’s Playbook was one of the best-selling tablets in Canada. Futureshop, Staples and Best Buy Canada have been selling more Playbooks than any other tablet. This still doesn’t mean RIM is making money from their sales (rumour has it that they are losing $80 on each unit). It does mean that they are getting a lot of attention, which might turn out to be a wise move now that buyers are more informed and interested in tablets. Not all consumers were drooling over the idea of a handheld “mini laptop” at first, but are now starting to choose them over netbooks. Discovering they don’t need to spend $499 on a new computer if they just want to surf the internet. With a starting price of $199, and a new operating system, the Playbook is really starting to look reasonable for consumers.